Have you ever used a lotion bar? I love them! They are so luxurious and good for the skin. A lotion bar stays solid at room temperature, but when you rub it onto your skin, your body temperature melts a tiny amount. The nourishing butters and oils are quickly absorbed, leaving your skin feeling soft, silky and deeply moisturized. And unlike lotions that contain mostly water, lotion bars have no added water making them super concentrated and just filled with the good stuff! It’s a long lasting, instant moisturizer with no mess in a convenient bar form. Love! Previously, I had been buying my lotion bars (THESE – great company!). But I noticed they had a very small ingredient list with items that I already had in my cabinet. And at $15 a pop, I wanted to try and make them myself. And it is SO easy, guys! Just 3 simple ingredients! 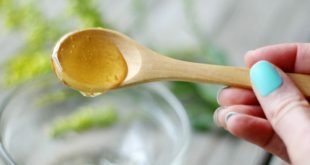 The formula for making a homemade lotion bar is super simple: just melt equal parts beeswax, butter, and oil. That’s it! 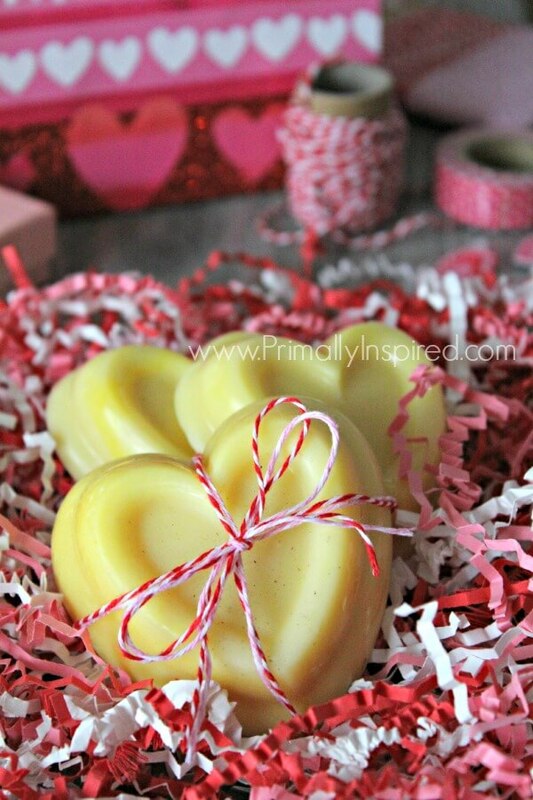 For this homemade white chocolate lotion bar, I use equal parts beeswax, unrefined, raw cocoa butter and coconut oil, all of which are deeply nourishing to the skin, highly moisturizing and are even known to help clear up skin conditions like psoriasis and eczema. And wow, this lotion bar smells absolutely divine! The cocoa butter makes it smell like white chocolate! Swoon. 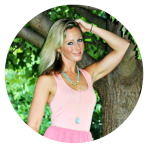 I hope you make this recipe – you are going to love it! 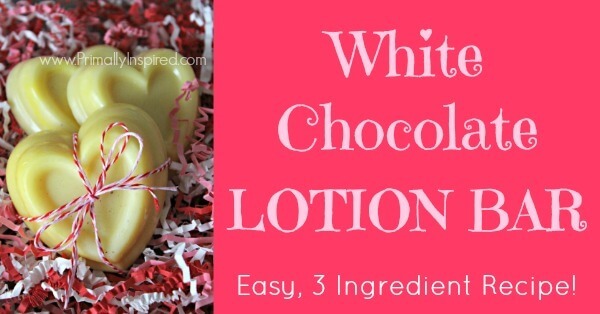 Make your own deeply moisturizing and luxurious homemade white chocolate lotion bar! Add a few inches of water to a skillet and place it on your stove at medium low heat. 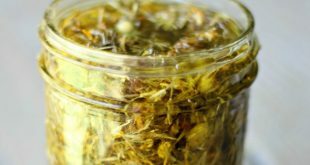 Place a heat-safe glass jar into the skillet and add your beeswax into the jar. Allow to melt - this can take 15 or more minutes. It's tempting to turn up the heat to make it melt faster, but don't do it! We need to preserve the beneficial, healing properties in these waxes, butters and oils so we need to melt them over a low temperature! Once the beeswax is melted, add your cocoa butter and coconut oil to the jar and allow to melt. 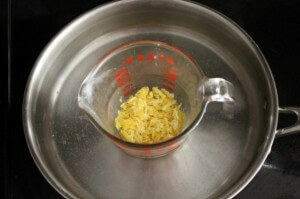 Once everything is melted together and completely liquid, remove the jar from the skillet and pour into your mold. I use THIS heart shaped mold. You can also use cupcake liners in a muffin pan. Keep the mold at room temperature for a few hours to harden. If you want to speed up the hardening process, place the mold in the refrigerator for at least a half an hour. Once the lotion bar has completely cooled, pop it out of the mold. Store at room temperature. 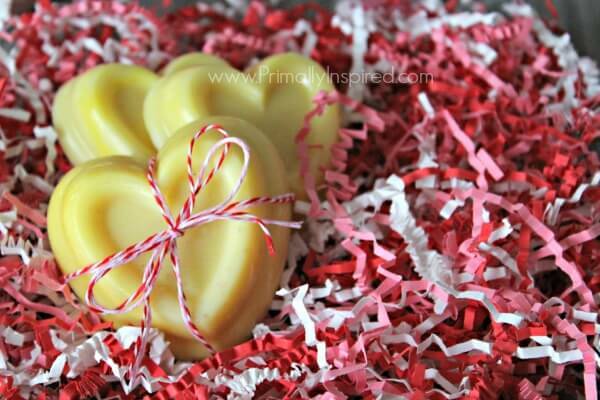 This recipe fills 1 heart shaped lotion bar in THIS 4-ounce heart mold. Say hello to instantly radiant and bright skin with this easy Brightening Face Mask Recipe. 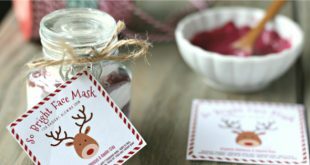 Free Printable Labels for DIY gift giving. 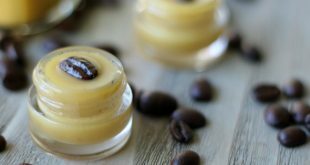 I’ve been making lotion bars for awhile now and love them! They are such a perfect gift and also great to travel with, since they don’t make a mess. Now I’m inspired to make some for Valentine’s Day! 🙂 Happy Valentine’s Day to you and your family, Elizabeth! Woo!! So happy to hear this! Just ordered what I need to make these!! I have two beautiful granddaughters who might love me after Valentine’s Day!! Thanks so much!! This is awesome! I was wondering, how long does it usually take your cocoa butter to ship from Amazon? Hi Alexia! I am an Amazon Prime member so it showed up on my doorstep in 2 days! Hiya! I made these and was so jazzed about it that I made ALL THE THINGS!! Hehe, I went ahead and also did the deep-pore cleansing mask, congestion relief bath salts, miracle salve, and sea salt scrub and put it all together in a beautiful gift basket for my mum’s birthday today. I can’t wait to give it to her! I wanted to post a pic of my basket here for you but I guess I can’t! Oh wow, Laura!! That is awesome 😀 You really did make allthethings!!! 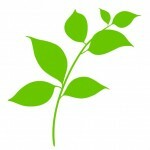 If you are on Facebook, I’d LOVE to see a pic of all of it — you could post on the Primally Inspired Facebook wall or in a message (http://facebook.com/PrimallyInspired). I hope your mom loves it all! HI, can you tell me what kind of packaging you use for this lotion bars?